Two Cumbrian businesses have scooped top honours at VisitEngland’s Awards for Excellence during a glittering ceremony at Blackpool’s Winter Gardens. Both The Sun Inn in Kirkby Lonsdale and Castlerigg Hall Caravan and Camping Park in Keswick secured a Highly Commended award in the Dog Friendly Business of the Year category and the Holiday Park / Holiday Village of the Year section respectively. 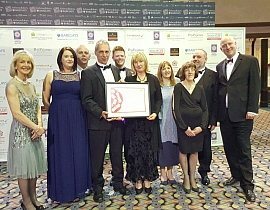 The national accolades were handed out last night, Tuesday 8 March, as part of English Tourism Week. With a history stretching back over 25 years, VisitEngland’s Awards for Excellence are firmly established as the highest accolade in English tourism. They recognise businesses that incorporate best practice, demonstrate excellence in customer service and celebrate the very best in quality and innovation. This year, VisitEngland received more than 400 applications from across the country. With over 40 years of continuous service, Cumbria Tourism is the lead organisation for tourism in the county and is at the heart of the Cumbria visitor economy. It has a membership of more than 2,600 members who in turn employ thousands of employees. In 2014, over 41 million people visited Cumbria contributing more than £2.44 billion to the local economy and support around 58,000 jobs.